If you need high quality treatment for your carpets & upholsterys in Maida Vale W9 at affordable price, we at Magic Carpet Cleaning can be your faithful assistants. Our certified cleaners will be at the door of your home in matter of few hours! We don’t rely on hidden charges and conditions. Our employees are trustworthy and certified. You can count on our professional work and rest assured that we can remove even old stains. We at Magic Carpet Cleaning love nature and try to protect it by using eco-friendly cleansing materials. We will work until we justify your expectations. Every day we learn new things in our professional sphere. We offer the latest solutions for the different types of pollution. We believe that this is one of the most effective approaches to thorough washing because of the use of hot water which efficiently destroys all microbes and allergens in the rugs. The eco-friendly detergents are injected into the rug by our cleaners under high temperature. Then, all the soil and blemishes are sucked out from the fabrics with the help of our reliable machines and tools. Our equipment is fully consistent for work in private homes and public buildings. If you are prone to developing allergies or have children or pets, we advise you to choose the steam carpet cleaning method. The dry cleaning method differs from the steam cleaning because it does not use water in the cleaning process. This treatment uses powdery compounds that are rubbed into the textile floor and are then sucked out by vacuum along with the contamination. Our cleaners use 98% biodegradable substances. The dry powder approach prevents the occurrence of mold which means that your carpet’s life is prolonged. It is also suitable for delicate fabrics. If you need to have a big business building, store or another 24 hour open public space thoroughly cleaned, this method is ideal for you. It does not require drying time and your property does not need to be closed for customers or clients. Most people prefer buying new floor coverings when their existing ones become too dirty. You should know that there is another option and it is to have your carpet professionally cleaned. The Maida Vale W9 cleaners can do this for you and you will be amazed by the result! You will see your rugs in an as new condition and you don’t have to spend a lot of money on buying new ones or lose time to go shopping. 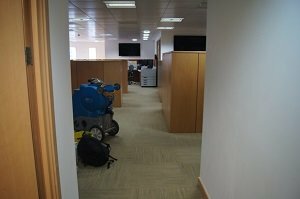 Our exclusive carpet cleaning services are designed to meet the highest standards in the business and your needs. Whether your floor covering is made of synthetic or natural material, our colleagues will restore it completely. Don’t despair if your home or office is dirty and covered with stains! We at Magic Carpet Cleaning are respectful to each of our individual clients and work hard until we meet their expectations and needs. Give us a call on 0208 861 0979 and you will see for yourselves.